Attention all wives- RED ALERT!! 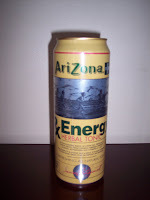 DO NOT, I repeat DO NOT ever let an already obnoxious spouse drink this new beverage made by Arizona. This can has 3 servings and is jammed packed with herbs for energy. Well, my Einstein of a husband drank the entire can! This explains his recent "take-over" and has placed him in the dog house for all his atrocious behavior! Ha! Men are like that. My husband doesn't even know what the term "serving size" means. Oh well, it's part of why we love them, right? Oh my God! Devil's beverage! Won't let my darling to drink this poison ever. Though it may influence his addiction to poker en ligne and he get rid of it?